Guy Ritchie has had some decent results in the past when it comes to putting his own spin on old stories, whether it be his two Sherlock Holmes films or his 2015 update of The Man From U.N.C.L.E, so attempting to do the same with the King Arthur mythos should be a slam-dunk, right? Oh, how wrong you’d be. King Arthur: Legend of the Sword is a royal disaster of epic proportions, a film so bafflingly terrible and ill-conceived it is almost impossible to describe in a single sentence. Luckily, these reviews are not that short, so on with the show. The film is an origin tale for the future king Arthur (Charlie Hunnam), who as a young boy is stripped of his birth-right after his uncle (a fascinatingly uninterested Jude Law) organises a coup on Camelot and his father (Eric Bana). Travelling Moses-style to the city of Londinium, Arthur grows up in a brothel and becomes a gang leader in the traditional Guy Ritchie manner, an interesting concept if it weren’t for the rest of the plot showing its ugly face. Naturally, the sword Excalibur is soon pulled from the stone by Arthur, and so begins a adventure that involves him finally mustering up the courage and resources to take back what is rightfully his. Oh, and did I mention this film opens with giant elephants? And that the main villain is in cahoots with a large tentacle monster that immediately makes you think of Ursula from Disney’s The Little Mermaid? And that at one point there’s a giant snake that comes out of nowhere to help the main heroes out, like some kind of deus exssssssssss machina? And there’s a section of the film where the main character must travel for no real reason to a land inhabited by giant rats, bats, and other enlarged creatures? And, if all that wasn’t enough, David Beckham of all people makes his acting debut as an evil guard, and let’s just say he’s no Vinnie Jones when it comes to his acting. Yes, all of these things happen in the film, because it is so dangerously demented that it thinks any kind of insane ideas like those would fly in a film about the classic King Arthur legend, but ends up looking sillier than anything in Monty Python and the Holy Grail, which to this day remains the greatest Arthurian film ever made (at least, according to me). I have no idea what kind of cocaine Ritchie was on when he came up with the ideas for this film, but clearly it was the kind of coke that caused oversight on important aspects like story, characters, colour scheme and ESPECIALLY editing (the latter of which deserves its own paragraph), because none of those things are even remotely done well here. The fact that this is a done-and-tried story of a rightful heir going up against an evil relative that’s taken the throne (a lot like The Lion King, making that the second time in this review I’ve had to reference a Disney film) is the least worrisome thing about it, as Ritchie allows his kinetic and grimy style overshadow the nothing characters in this film, and the mostly lacklustre performances given by the actors (Hunnam is trying his damnedest with the material he’s given, and mostly comes through with some dignity intact), not to mention cinematography that is downright ugly in places and along with the terrible CGI makes this an even more unpleasant viewing experience. This isn’t even enough for it to qualify as a style-over-substance film, because both the style and the substance are piss-poor in execution, since Ritchie also feels like he’s on autopilot when he’s displaying his typical tropes, from the fast-paced conversations to the many Cockney accents which here are just obnoxious and pile on top of all the other obnoxious and bizarre moments in the film. But seriously, we need to talk about that atrocious editing. If you thought it was bad in Suicide Squad, trust me when I say that after seeing this unholy abomination, you’ll look back on that film with fond memories. This might be one of the worst-edited movies I’ve seen in years, quite possibly ever, and should serve as its own masterclass in how not to edit a film and then release it into cinemas nationwide. Throughout the film, it will cut back and forth to scenes already in progress and then before, which is something I have seen before in Guy Ritchie films but never to this extent, making it not just confusing but headache-inducing since it is so ADHD you’d swear that someone with the condition was actually the one putting this whole thing together. I can’t think of a single scene that flowed naturally or even in chronological order, it is that disjoined and randomly thrown together; it will confuse and confound you with just how horribly structured this film is, and I assure you that you will not be ready for its sheer incompetence, no matter how many reviews you read that mention how awful the editing is. It’s pretty damn clear that King Arthur: Legend of the Sword is a flop of the highest order, one that should be noted as being a rival against Swept Away for being the worst Guy Ritchie film ever made, and should make you very worried about what Ritchie has next on his plate (apparently, he’s up to do Disney’s live-action version of Aladdin next… oh dear). 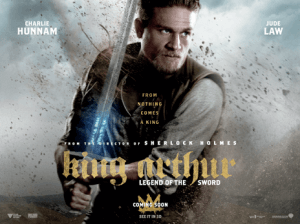 King Arthur: Legend of the Sword is an atrociously put-together flop with some of the most bizarre and insane ideas ever associated with the Arthurian myth, none of them working, and loosely sewn together with some of the worst editing you’ll see in years. It’s a royal disaster of the highest order, and should be avoided wherever possible.